Are you sitting down? Good because you are about to laugh your face off. 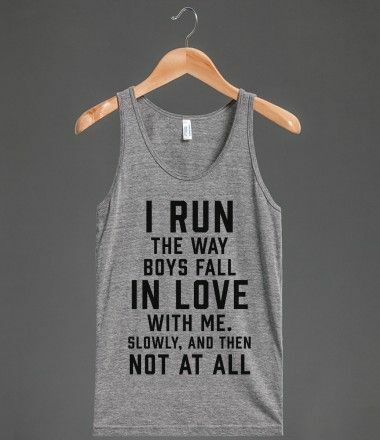 I was perusing Pinterest yesterday and I was on the floor laughing at all the funny running shirts. I am going to start a GoFundMe just so I can acquire all of these shirts and sweaters. I WANT THEM ALL! Most of these shirts are for sale, just click the picture and it will take you to the vendor's website. So here is your ab workout for the day, I present to you 36 Hilarious Running Shirts. Before we even get started, this shirt wins. I Run The Way Boys Fall In Love With Me. Slowly, And Then Not At All. 17. Shut Up! I'm NOT "almost there!" 27. i'm only doing this so i can post a picture on facebook. 33. Why Are All of These Princesses Chasing Me?! ?